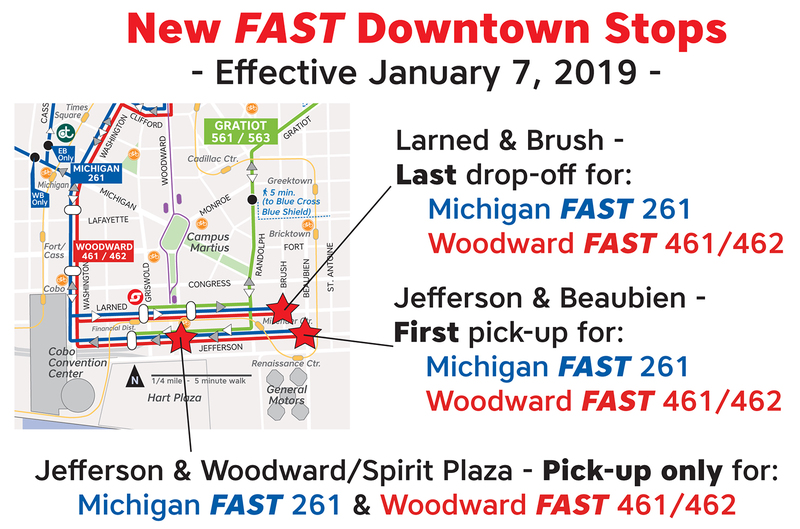 FAST is a new service powered by SMART, which offers limited stops and connects the suburbs to downtown quickly and easily. 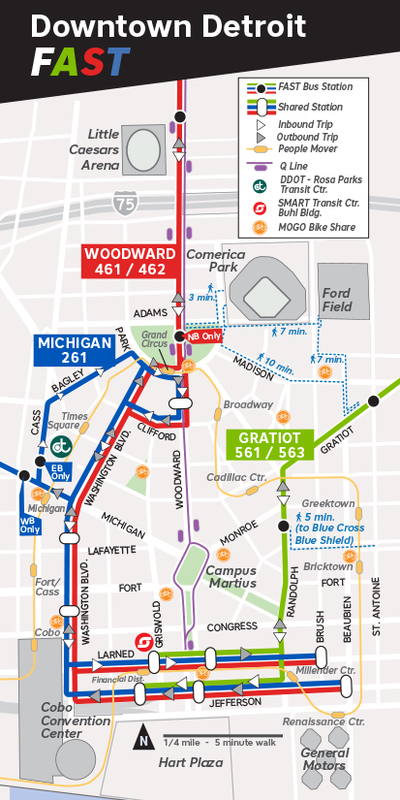 The new high-frequency service travels along three of Detroit’s busiest corridors, Gratiot, Woodward, and Michigan, and only stops at designated FAST stops. Unlike the traditional SMART routes, where there are stops on nearly every block, FAST only stops about every mile. This allows us to streamline the service and provide better access to destinations and transfer points. FAST buses come every 15 minutes for peak operating hours and operate 7 days a week, even late-nights and weekends. This new service never requires a transfer at the Detroit border. 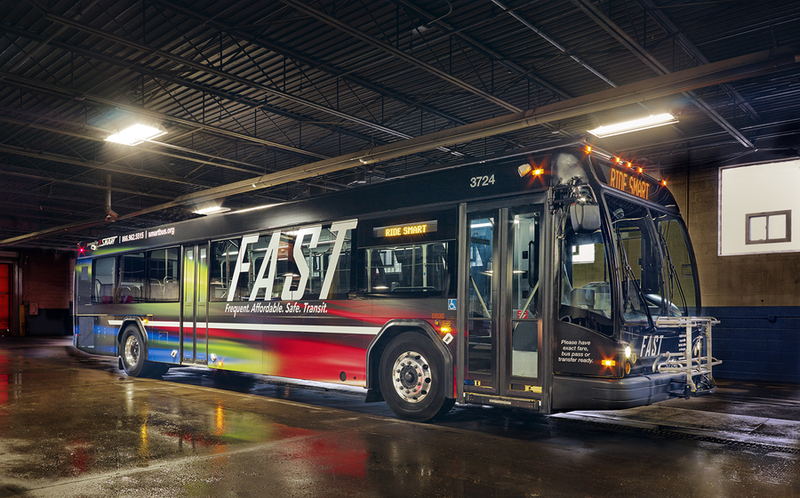 The all-new FAST service offers a fresh new look, streamlined service, free WiFi, and the same low fare! It is still only $2.00 for a one-way trip and reduced fare rates are still accepted for eligible riders. See if you’re eligible here. While you can only board and deboard at designated FAST stops, you can use any SMART route to transfer. Transfer fees are still only $.25 and in most cases, your usual local will connect you to a FAST bus. Downtown riders will want to note that the stops on Jefferson and Larned serve certain routes and certain directions only. Please be sure to pay attention to information at the stops and on the bus display sign. The stops used to leave downtown will not be the same as the stops where you exited the bus. Downtown, Royal Oak Transit Centers, Wayne State University Student Center, Henry Ford College, and Oakland Community College campuses. Catch our all-new FAST commercials to find out where we go! SMART helps you conveniently travel to work, school, medical appointments or your favorite shopping and entertainment venues. Our new service FAST streamlines that function.